Explore some of the most stunning interior spaces you’ll ever see – spaces you’d surely pass by without a second glance if you weren’t shown them by a seasoned, in-the-know tour guide. You may have experienced the buzz of activity throughout Chicago’s Loop: business people and politicians rushing from meeting to meeting, tourists scurrying from sight to sight on their “To See” lists, suburbanites zipping from store to store on their shopping sprees. But you’ve probably never glimpsed the enchanting world that lies just behind the doors of many of the buildings that people pass by every day! You will be guided away from the hustle and bustle of downtown Chicago, and into some of the most stunning interior spaces you’ll ever see – spaces you’d surely pass by without a second glance if you weren’t shown them by a seasoned, in-the-know tour guide. There are a number of buildings worth visiting for their interior architectural details, buildings that offer tourists the opportunity to enjoy over two centuries’ worth of hidden architectural wonders lying just behind the noisy facade of the Loop. On these walking tours, you’ll be amazed at the beauty lying just beyond the facade that everyone else sees. 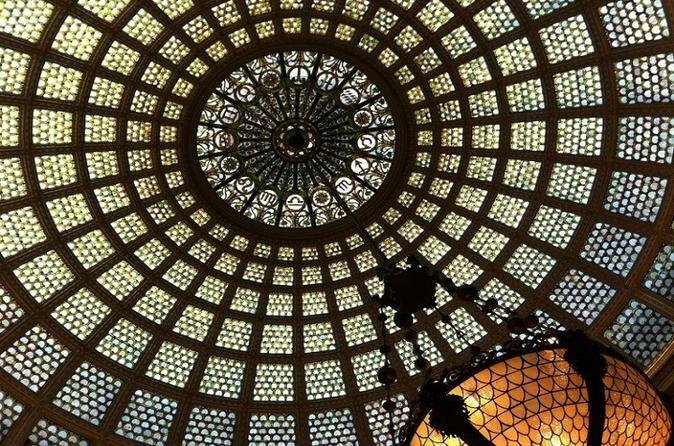 With Inside Chicago Walking Tours, you’ll get to know Chicago like you’ve never known it before! Chicago’s Loop, full of offices, courtrooms, retail spaces, and all kinds of business, is truly an overlooked treasure in terms of its gorgeous interior spaces. There is so much beauty there, behind that noisy exterior: It’s a beauty that is visible and there for the taking. See this “second side” of the Second City!